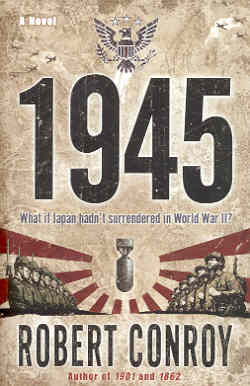 What if Japan hadn't surrendered in World War II? This alternative history novel with a fast-moving, believable plot answers this question with a few surprises along the way. Robert Conroy, author of two other alternative histories (1862 and 1901), objectively presents both the American and Japanese sides of the conflict. The story does not provide many historical, chronological, and geographical details but rather gives an overview of strategies and battles. The main characters include leaders and military personnel from both sides. Even though Emperor Hirohito records a speech of surrender to be broadcast by radio, the message never gets broadcast since Army General Anami succeeds in his rebellion against the faction wanting peace. An Army officer with Anami's faction kidnaps and takes Emperor Hirohito to a hiding place near Nagasaki. President Truman decides on an American invasion of Japan's southernmost main island of Kyushu when the dropping of a third atomic bomb fails to bring the war to an end. American intelligence decides to drop off a one-armed Japanese-American named Joe Nomura in northern Kyushu so that he can radio back information about the situation he finds on the ground. Operation Olympia, the name for the American invasion of Kyushu, results in 350,000 casualties, including about one third killed. An American general decides, without specific approval from President Truman, to use a fourth atomic bomb on a military target of Japanese troops trying to cross the strait between Honshu and Kyushu. The American agent Nomura by accident discovers the hiding place of Hirohito, so the American military executes an operation to take the Emperor to an aircraft carrier where he and President Truman finalize peace between the two countries. Japanese kamikaze aircraft and other special attack suicide squadrons such as explosive motorboats and kaiten human torpedoes get mention in this alternative history, but the author provides few details. Some statistics of kamikaze success seem incredible when compared to their relatively limited success in the last two months of the real Pacific War. Admiral Nimitz in the novel states that during the Kyushu invasion kamikaze aircraft sunk a score of small carriers, a number of light cruisers and destroyers, and at least 100 transports (p. 260). The author also incorrectly refers to the aircraft carrier Franklin being struck by a kamikaze plane that killed 800 men, whereas actually a conventional bomber dropped two bombs onto the carrier's flight deck (p. 98). 1945 includes descriptions of less than a handful of suicide attacks. A nighttime kamikaze crash into the cruiser Augusta off the coast of Kyushu kills General MacArthur. Little gets revealed about this kamikaze pilot, but he wants revenge for the bombing of his family, shrieks "banzai" as he flies the plane, and closes his eyes and thinks of his family just before hitting his target. Commander Hashimoto of the submarine I-58, which successfully used torpedoes to sink the US cruiser Indianapolis (CA-35) in July 1945, launches two kaiten human torpedoes in the novel to sink the American submarine that dropped off intelligence agent Joe Nomura on the coast of northern Kyushu. As the Americans advance over land during the Kyushu invasion, the Japanese shift their kamikaze aircraft attacks from ships to land targets such as fuel dumps and supply depots. The book's 80 chapters shift quickly from place to place and from character to character, but the basic plot remains understandable. The plot thread of agent Joe Nomura turns out to be the most suspenseful and surprising, whereas the story of the American ground troops is harder to follow and less interesting. The invented conversations of American political and military leaders skillfully reveal the different issues that would have been faced by them if the Pacific War had continued.